When I was about 10 years old I attended summer camp on the eastern shore of Maryland. This was a warm flat area on the edge of the Chesapeake Bay. 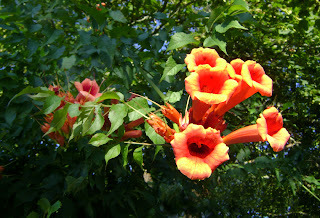 There I noticed my first trumpet vine. The plant's vines look a lot like Wisteria until it blooms in mid summer. It is a bit of a weedy plant, but I like it a lot. There is also a yellow version if the deep orange tone does not fit with your needs. When the hole was dug some soil was put to the side for back filling around the foundation later. 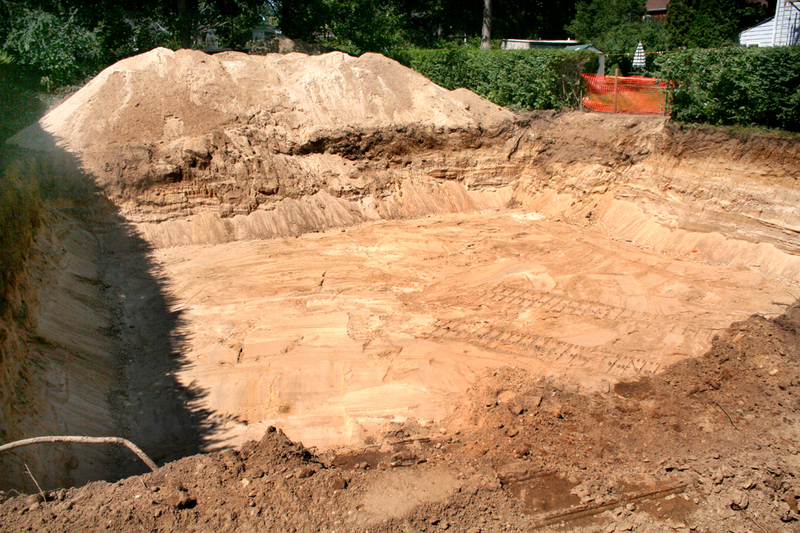 Before that is done the local building inspector will check that the footings, foundation and water proofing have been done to code. 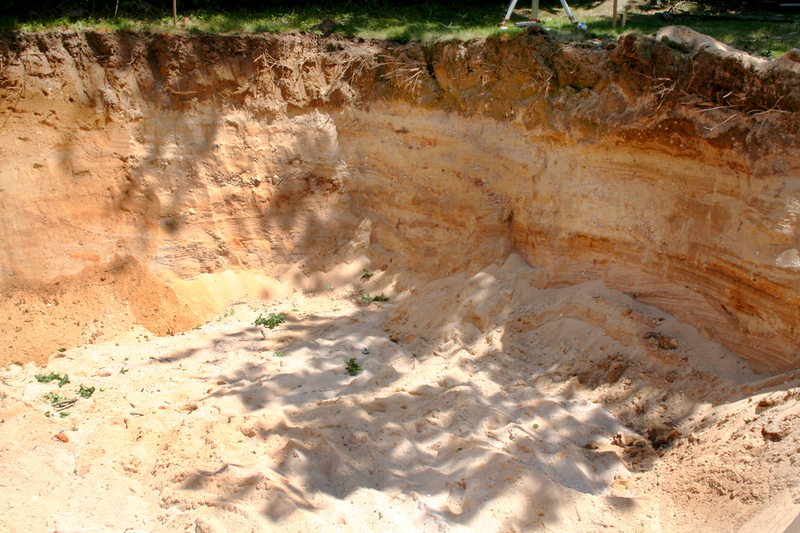 Once those are signed off on the sandy soil can be used to back fill around the foundation. The top soil from dig is stored behind the sand soil. That dirt will be spread as top dressing when the home is almost finished. The first sun flowers I ever saw had a single bloom towering way up in the sky. For years those simple big yellow blooms were the only sun flowers I knew of. In the 80s when I started my first Hampton's garden I found these fun sun flowers that come in a riot of colors with multiple blooms on a plant. 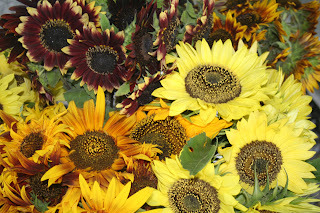 This style of sunflower reminds me of Van Gogh's paintings. 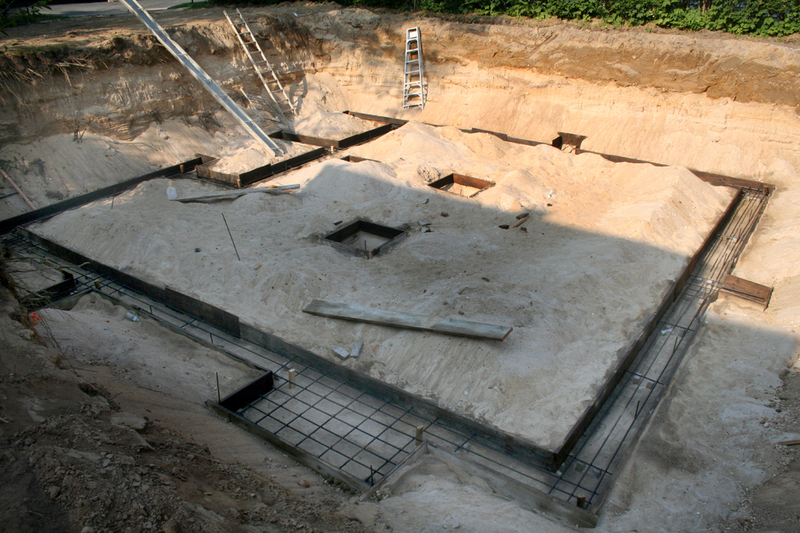 The finished foundation walls are now resting on the footing in a big hole. 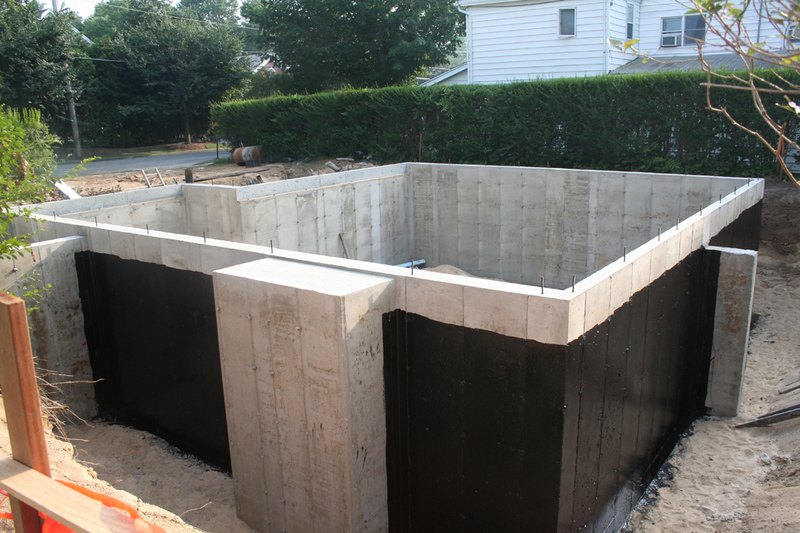 A tar-like waterproofing has been applied to the exterior foundation walls to help keep the basement dry. The gray block in the foreground will support a fireplace and chimney. Bolts have been set in the concrete to secure the wood framing to the foundation. This shrub know as Rose-of-Sharon is in the Hibiscus family and comes in a variety of colors. I have grown partial to this all white version. Unlike the bright colored ones sold in patio pots this plant is very winter hardy. After the concrete has cured the forms are removed. The forms have tie rods that hold the forms in place prevent the forms from spreading from the weight of the wet concrete. These ties are released from the forms and the form work can be removed. The ties will remain lodged in the concrete walls for ever. 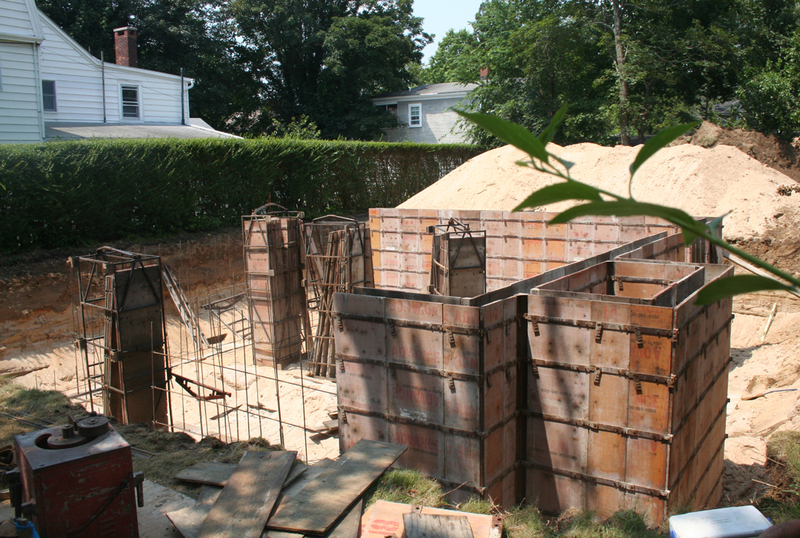 The forms are stacked by size and will be used to make another foundation. 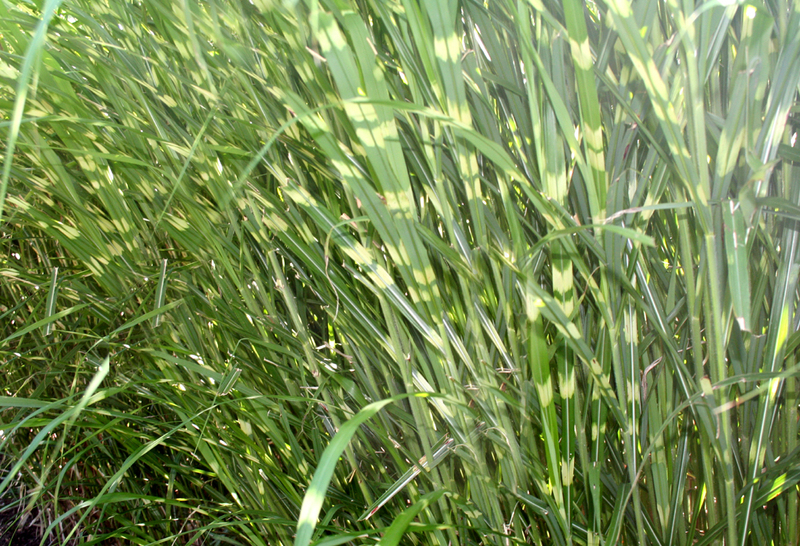 I like this ornamental grass that I have always called Zebra Grass. The accents in the leaves look like shafts of light cutting through the greenery. 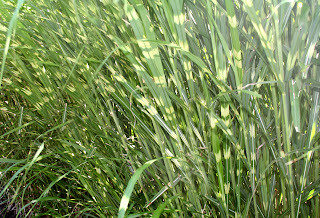 If you fertilize the grass too much the highlights will turn green and not show. 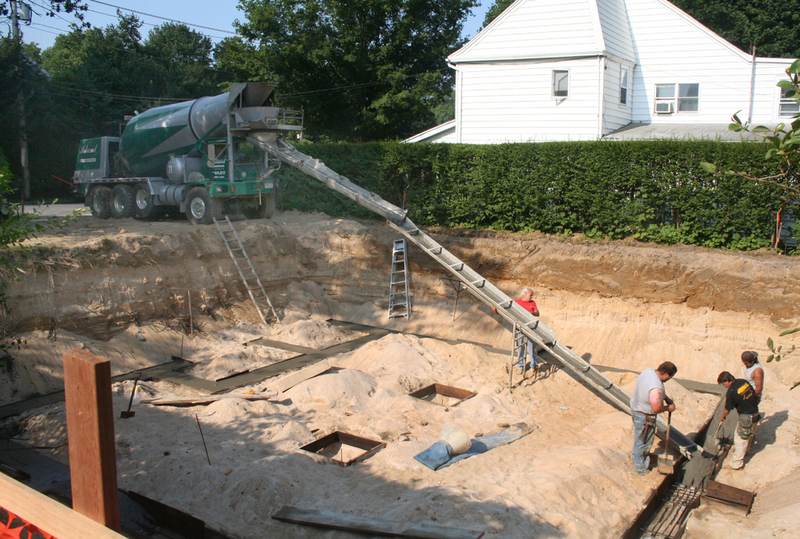 Filling the form work for concrete foundations used to be a tedious project often requiring carting wheelbarrow loads of cement one at a time. 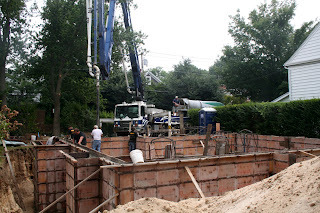 Modern foundations are filled by pumping the concrete into place. The pump truck is separate machine from the cement trucks we know. The cement trucks loads a hopper that collects the cement slurry and sends up through a giant tube to be directed where it is needed. The garden of this home incorporates two manmade ponds to draw the bays waterfront up into the property. One pond featured waterlilies the nearer one lotus. Water lilies sit on the water surface, lotus project above the waterline. This form work being erected will shape the walls for the cellar that support the home. Most new homes in the hamptons now have a poured concrete foundation. Early foundation walls got built of stone, then came red brick, followed by concrete block in the 1970s & 80s. Now poured concrete walls have become the popular choice. 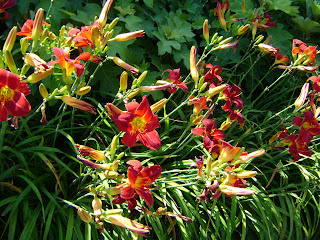 These rich red lilies have blooms in the new style. The wider petals show well in a garden setting. Cross Island Concrete has been doing the foundation work on this project. That includes all the form work and pouring to concrete. In this photo they are filling the footing, after the footing cures they will build foundations on the footing, the square boxes in the center are to support columns. I am talking a few postings to show choices I have made for my garden. 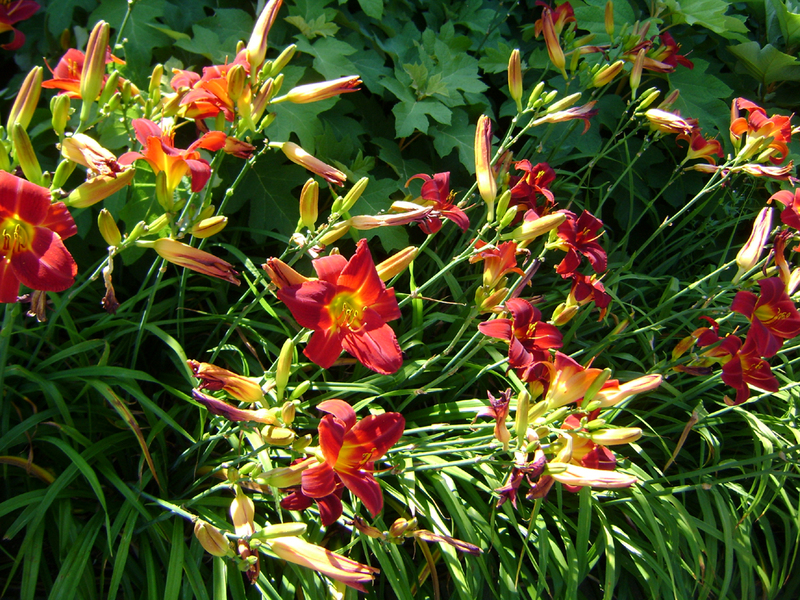 The newer styles of lilies tend to have meaty petals forming a thick rich cone. I love this older lily with a more delicate structure and pale pastel tones. 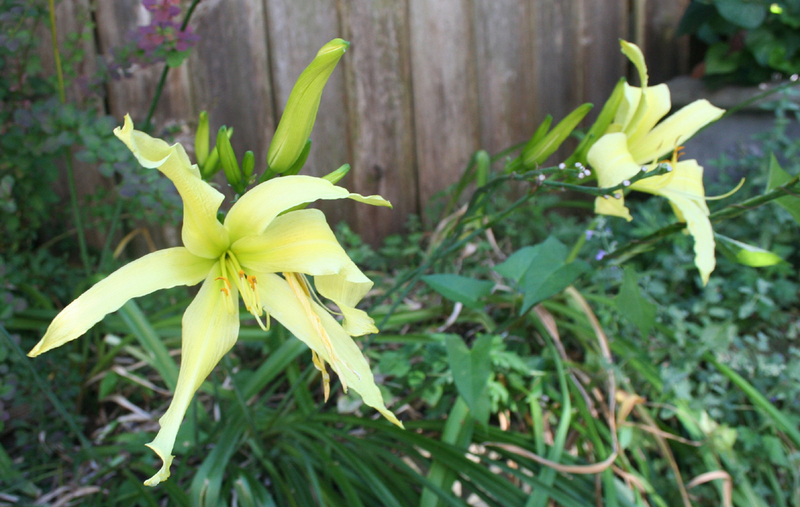 My mother had a clump of yellow lilies like this in our garden in Baltimore. The weight of a house comes down through the walls & columns. This weight is supported by footings. The footing is a wide thick base the spreads the weight from above out over a larger area of earth. Great care is taken that the earth under the footing is virgin earth, earth that has not been disturbed. 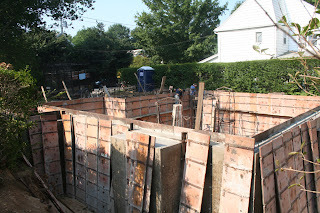 The wooden frames (form work) will hold the poured concrete in place till it sets up. The box in the for ground is most likely for a fireplace and chimney. 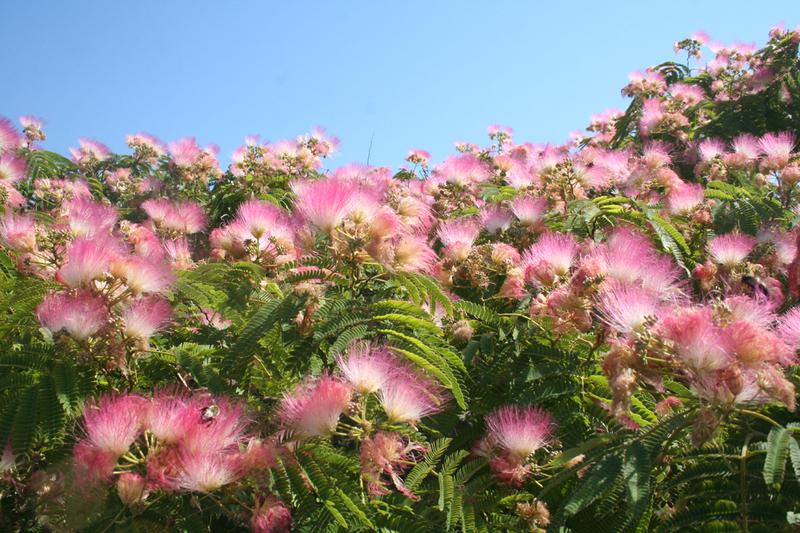 This Mimosa is in full bloom with local bees having a feeding frenzy. 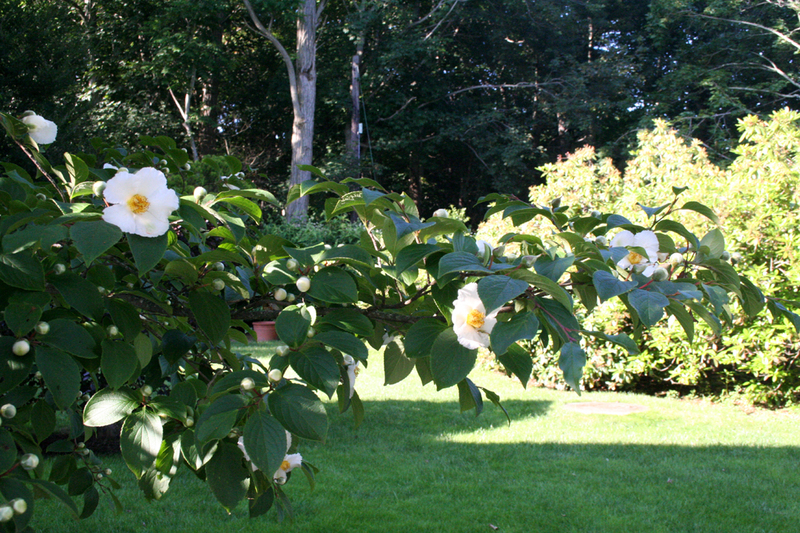 This tree can be a good choice for summer shade as it is late to leaf out. I think the tree has gone out of favor as it tends to make a mess from all the parts it sheds. Yesterday they broke ground in the empty lot to the west of me. The next day they finished the excavation creating a precise level flat bottom hole. The is how building a new house starts. I plan to track this in photographs, and explain the parts as the house grows. 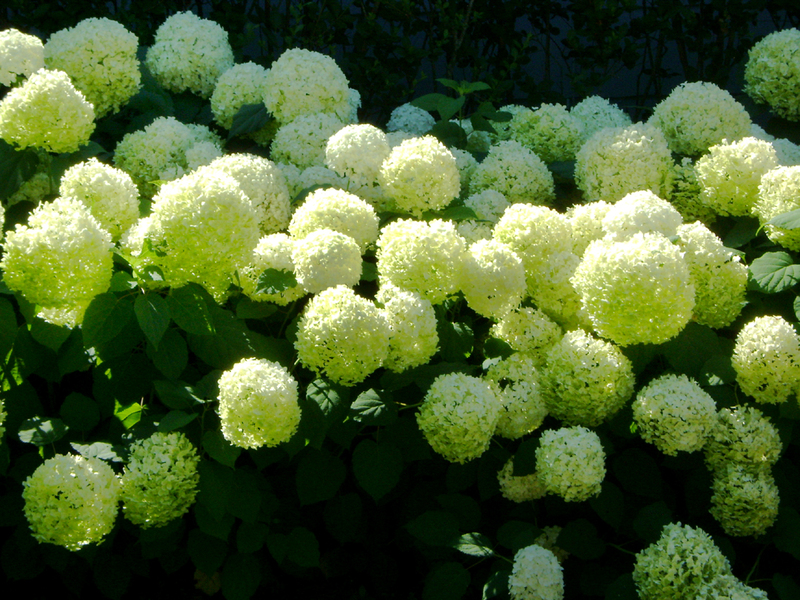 This has been a great year for hydrangea. Most all versions seen to have a very heavy bloom this season. They are digging a foundation for a house near where I am staying this summer. 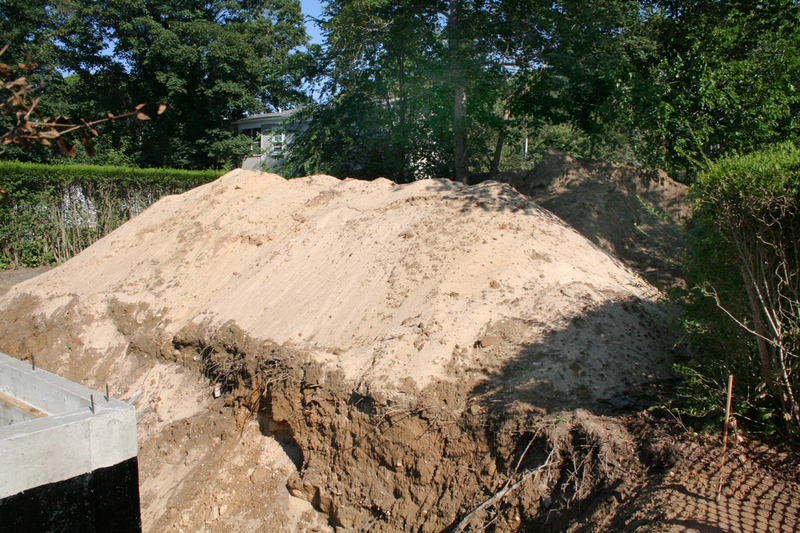 The excavation shows about 18 inches of topsoil at the surface, then just layers and layers of sand. We really do live on a sandbar. 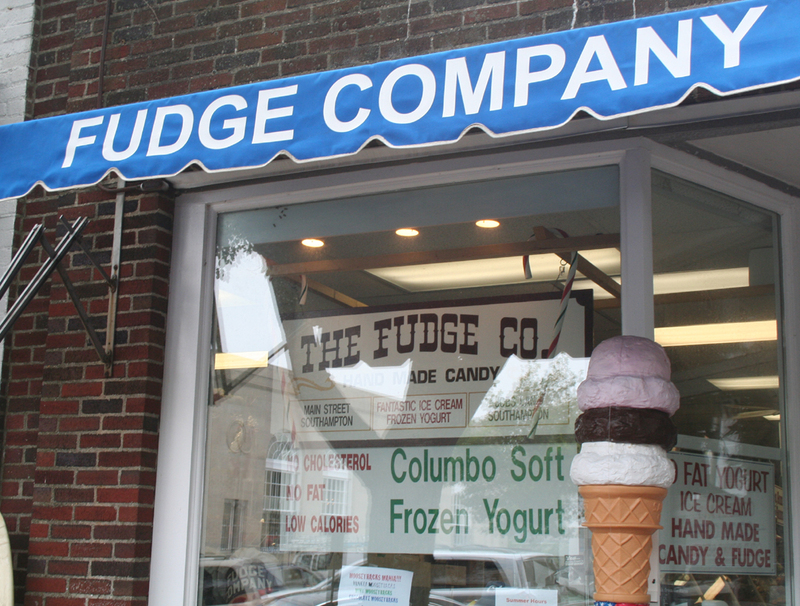 Summer is here, it is nice to stop in for a cone. They have both classic & soft serve. I wish I knew more about mushrooms, a lot more..... 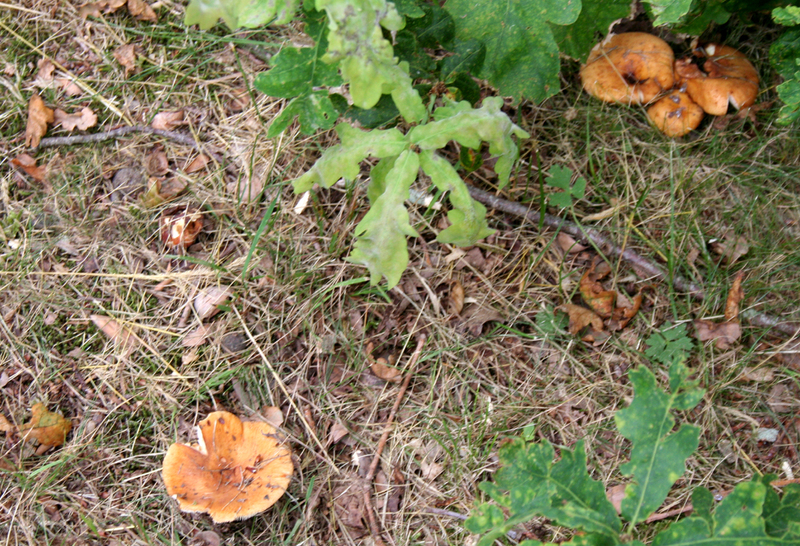 Growing in the fallout from oak trees these might be delicious shiitake mushrooms, but they might not and make one very sick. 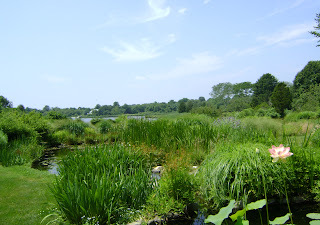 There is a short section of Edge Of Woods Road in Water Mill that runs between Seven Ponds Towd Road and Water Mill Towd Road. 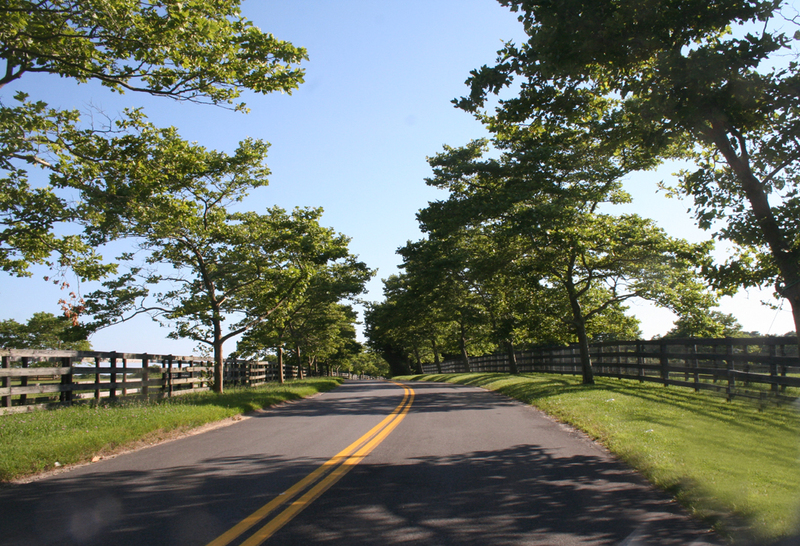 This patch of road is flanked by very fine horse fields on both sides making it a very nice bit. 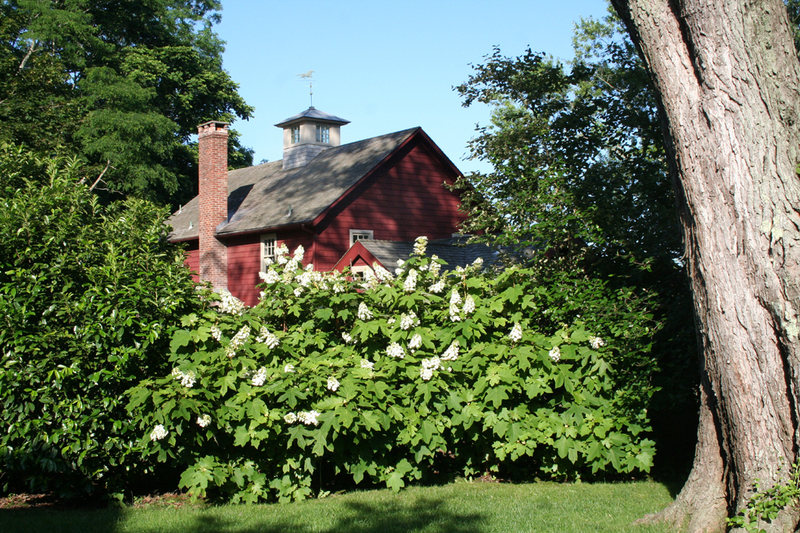 The nice hedge of hydrangea makes a nice frame to the view of this barn style home. I was told by a friend that this home used to be a one story 1960's style ranch. Wow what a stylish make-over. My friend Chris is rowing around Long Island to benefit wounded veterans. He started on the north shore going west, past NYC on the East River, south of JFK Airport and then working his way east. This morning I was told that he was passing Shinnecock Inlet. 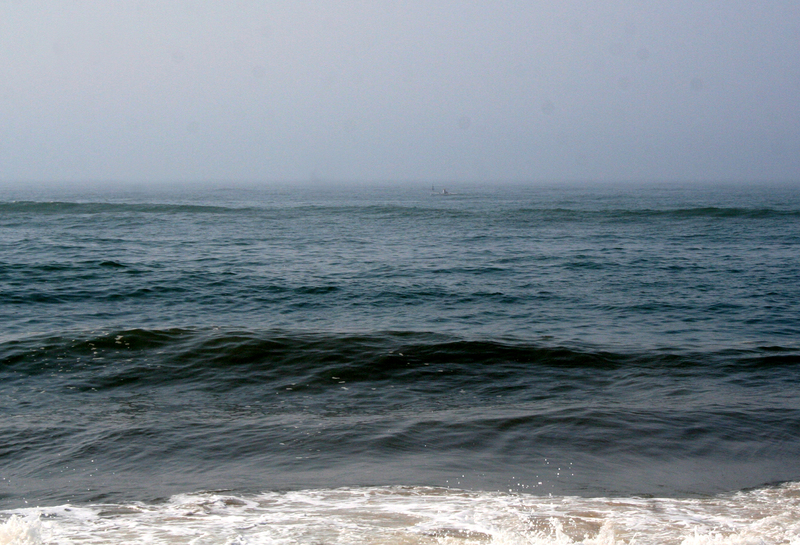 I headed to the beach to wait. I could best spot him when his oars would glint in the sun, the mist did not help. His movement was like the hour hand on a clock, watching him he did not appear to move at all, but looking back I could see that he had moved along. 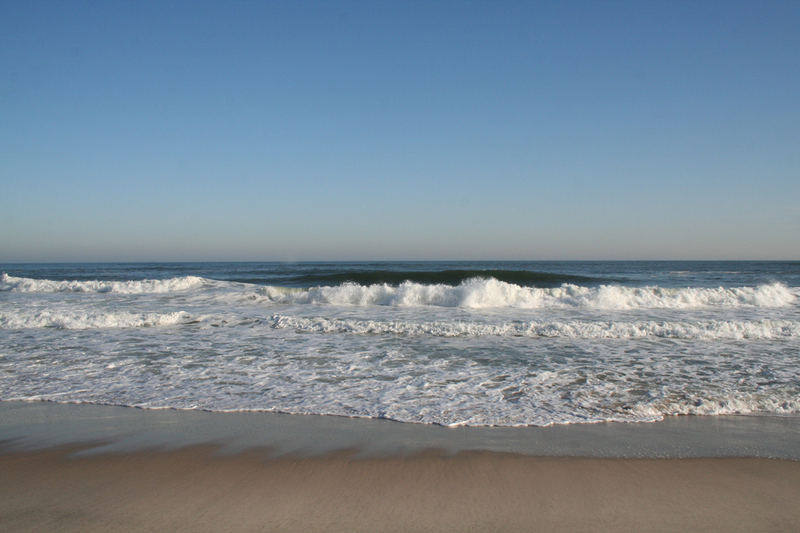 This picture at Halsey Neck Beach was taken at 9:25 am, Chris is mid frame. 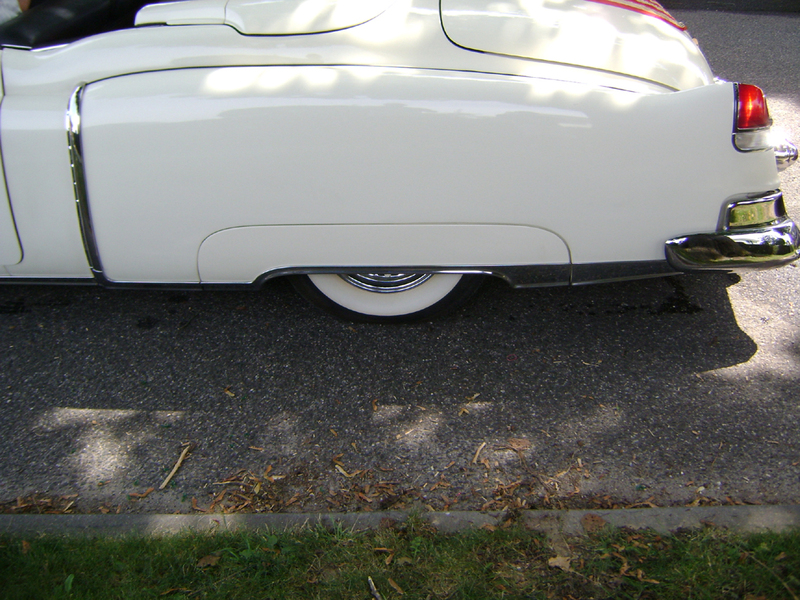 In the 1950s and 60s better cars had a trim panel to cover much of the rear tire. In those days one did not look at rear wheels or women's knees. The panel came off, this could make changing a tire a lot more work. This spring I found a location on the side of my house where a climbing rose could grow. Not sure what rose to get I called a few buddies at the Southampton Rose Society. They recommended FOURTH OF JULY. I contacted Lynches, and they got me a nice plant that has bloomed in it's first season in my garden. 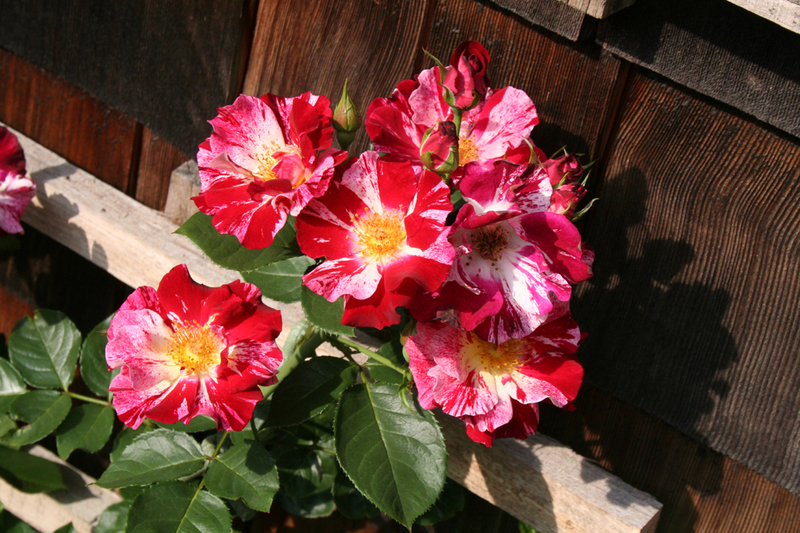 Early this year the Southampton Rose Society contacted me. 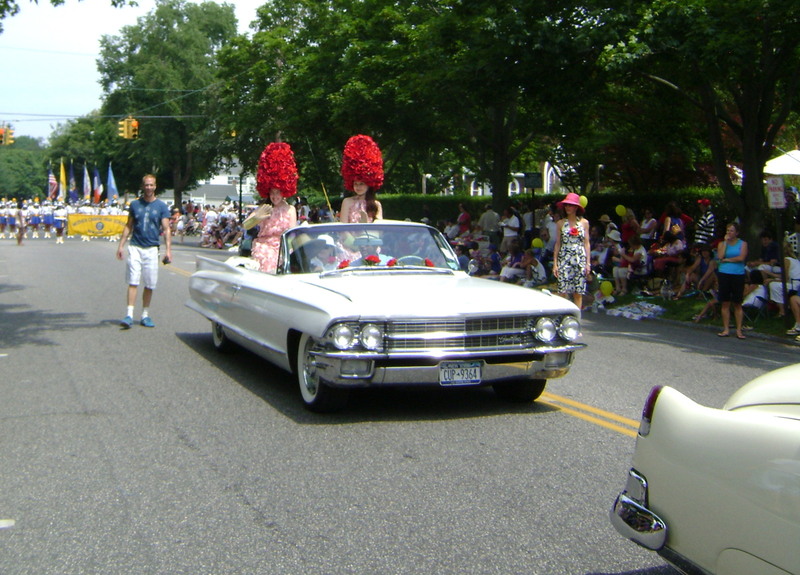 They wanted me to design an entry for the Southampton 4th of July parade. 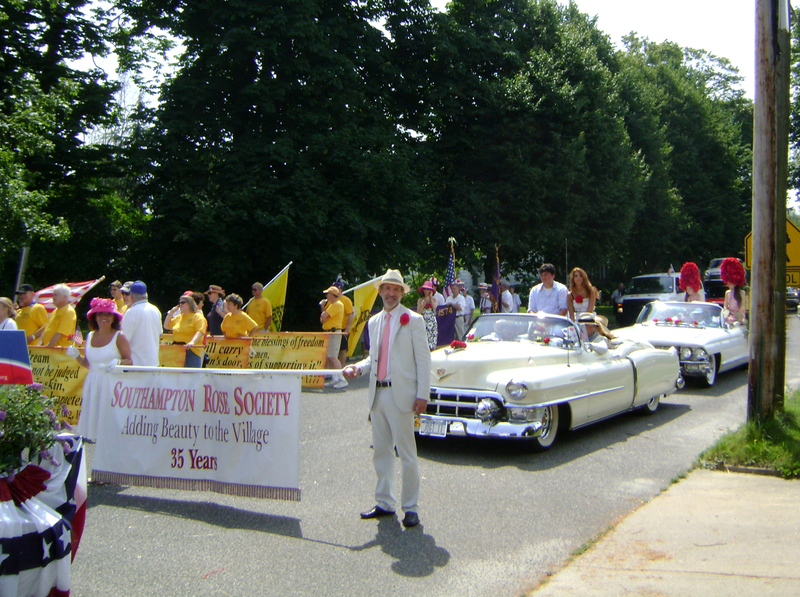 This was the 35 anniversary for the Rose Society. Wendy helps the Rose Girls check out their look before the parade gets started. 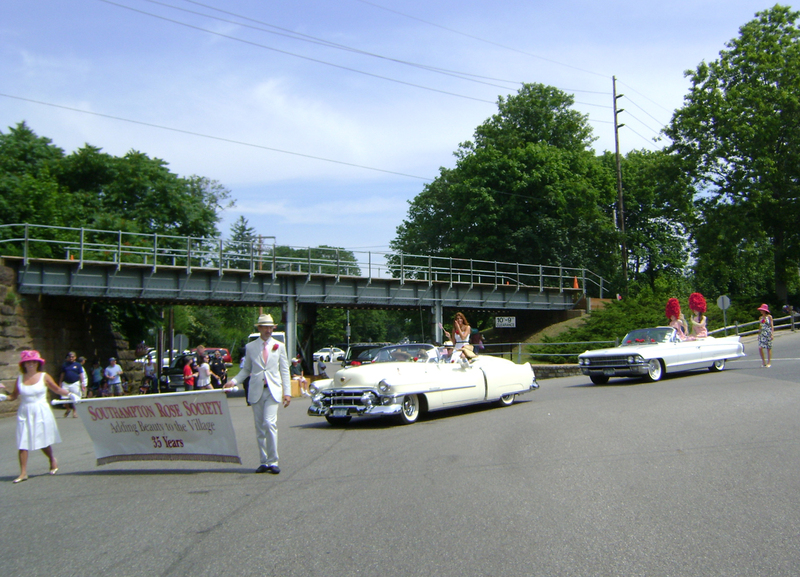 We had a caravan of classic cars with Rose Girls as the stars. There was a nice big banner to tell of the SRS's 35 years of service to the community. I made the outfits for our "Rose Girls" with great rose beehives, rose pink applique dresses and opera length garden gloves. Wendy & I walked beside the Rose Girls as tech support in case a fix was needed. All went well. 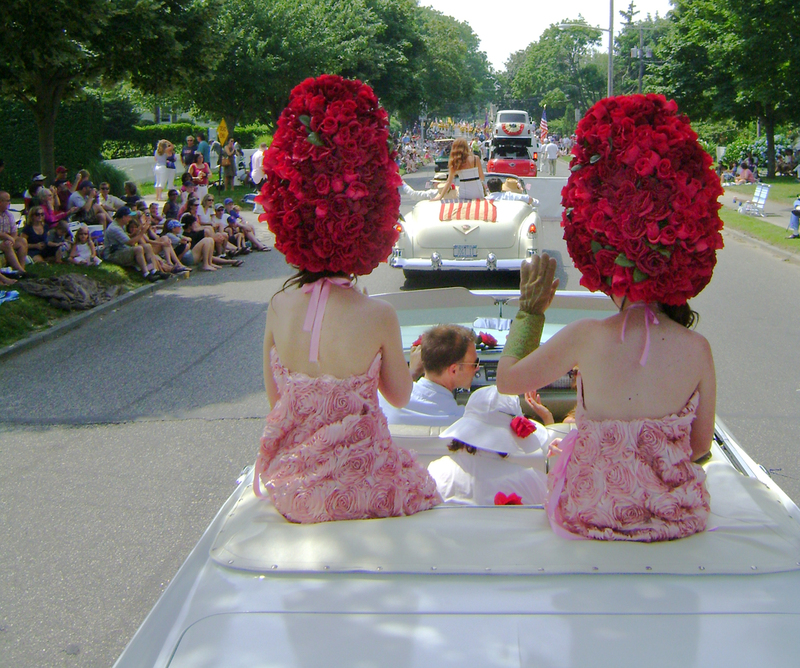 I got the idea of the rose hats from rose globes I saw at Lord & Taylor. 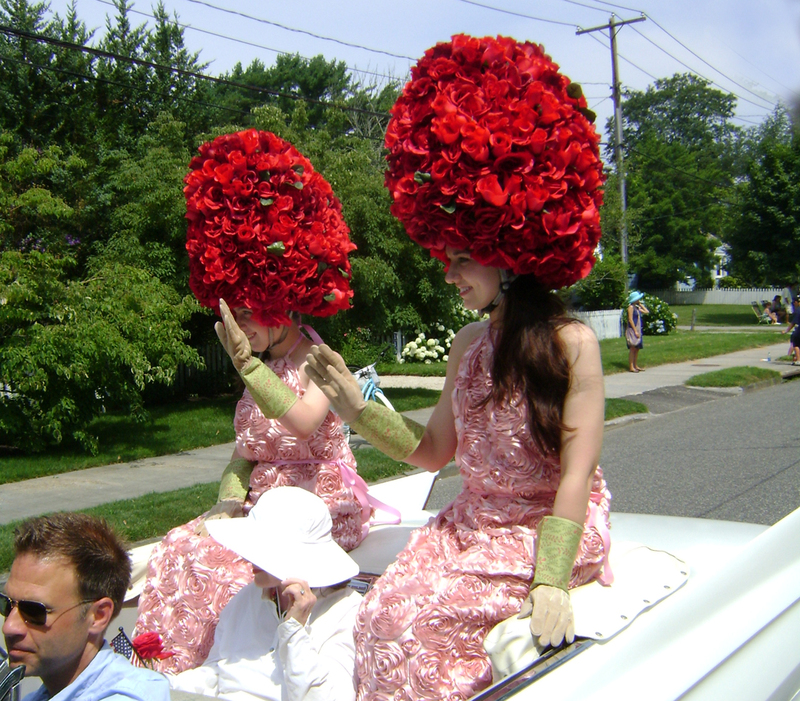 Our rose hats each had more than 24 dozen roses. 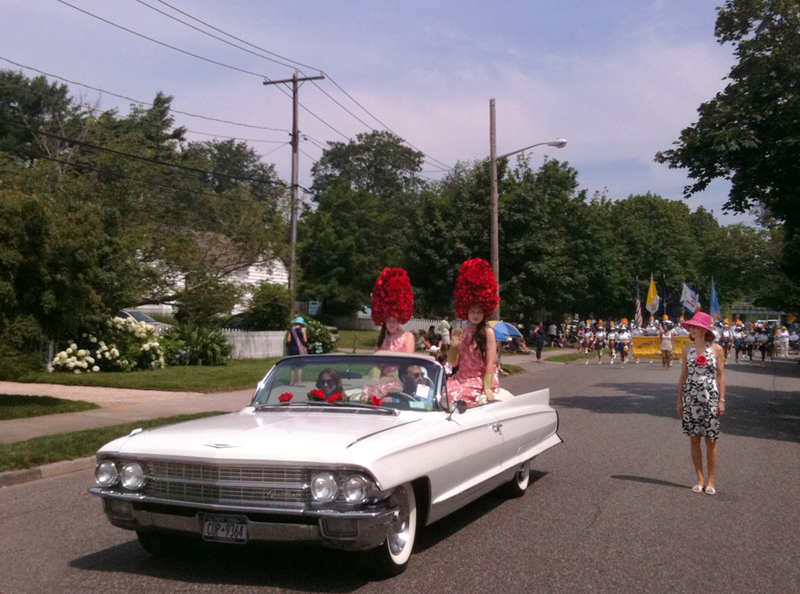 It seemed that our ROSE GIRLS, Sarah & Ingrid were the hit of the parade. 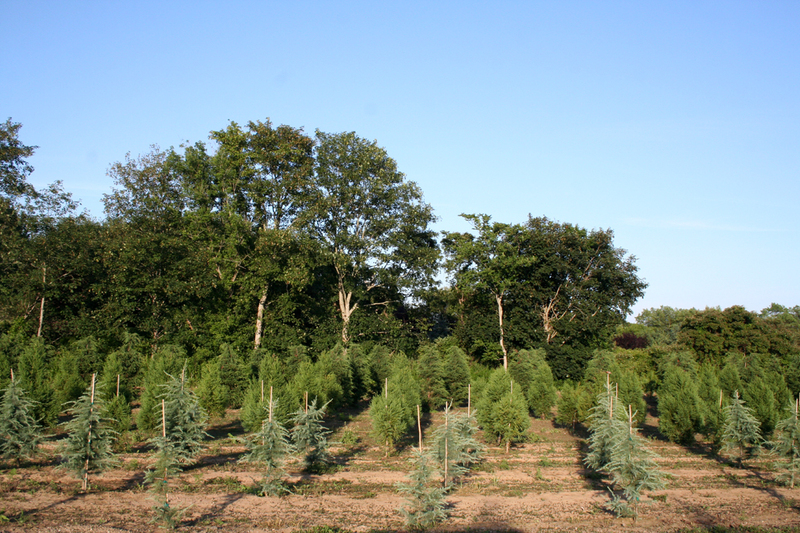 Tree farms must be a good business, we have a lot of them out here. The trees in this farm are so young they have sticks to keep them on track. Water Mill has a water mill. This is surprising as the land is so flat around here, and one needs moving water to make the mill turn. The mill is set between two ponds with just enough drop to make a water wheel turn. 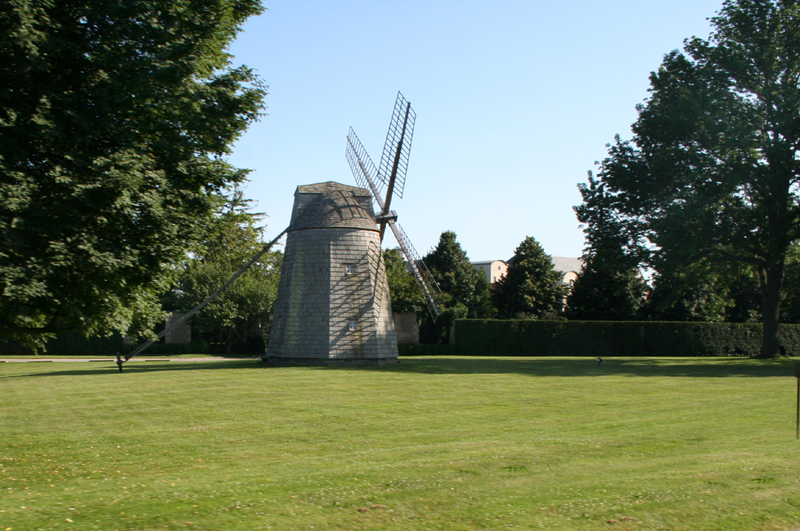 There is also a windmill on the main green in Water Mill. 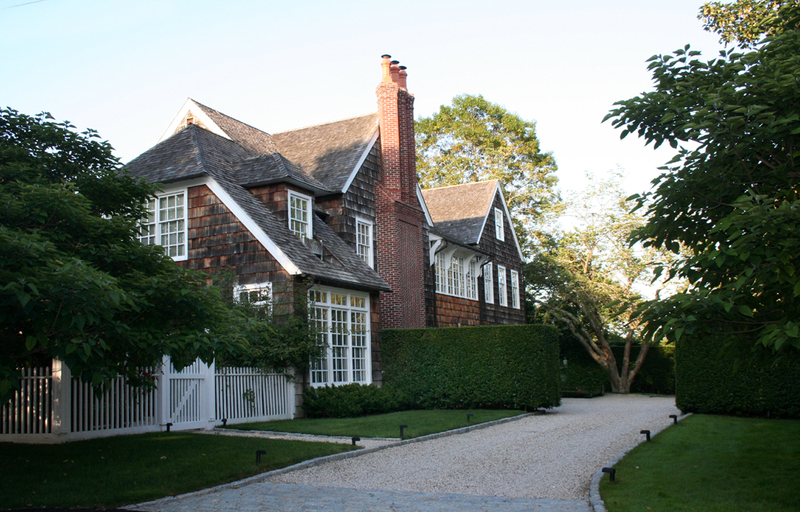 There are more windmills in the Hamptons, many at private homes. 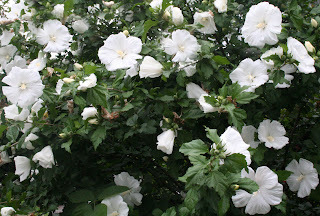 This large shrub at my friend Susan's garden has open white flowers like you might see on a rose.